E-commerce will take an ever-growing share of those sales, continuing its year-long acceleration. Online sales accounted for nearly 9 percent of overall sales in the third quarter of 2017, FGRT reports. Tech products likely will be a major gift category this year, driven by Apple’s new iPhone X and related accessories, declining prices for 4K TVs, and intelligent speakers, writes FGRT Managing Director Deborah Weinswig. Apparel gifts also will feature prominently on shoppers’ lists, she added, with items from Gucci (and more affordable versions from H&M and Zara), Coach and Gap likely to be popular. Vintage looks, especially 1960s-inspired pieces such as short ankle boots and bell bottoms, also will appeal to consumers. Other factors that should encourage sales increases this year include cooler weather in November and December compared with 2016, which should boost seasonal apparel, and easier year-over-year sales comparisons due to last year’s traffic dip prior to the U.S. presidential election. The full report can be found here. 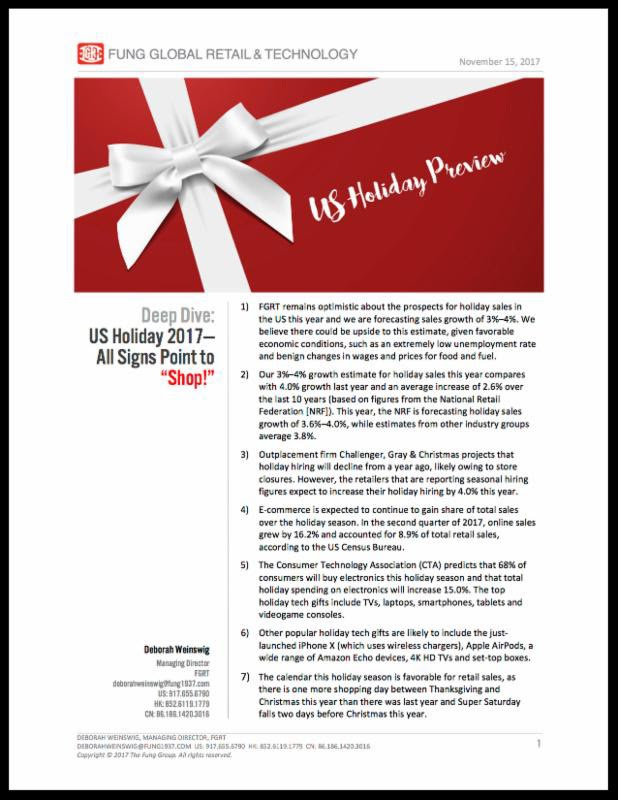 Other recent reports issued by FGRT include: “Deep Dive: Hottest Holiday Toys 2017,” “Deep Dive: The Future Customer Experience-AI and IoT in Retail,”and “Deep Dive: China Consumer Survey-Insights on the Positioning of the Leading Online Platforms for Apparel.” FGRT’s reports and analyses can be found at www.FGRT.com andwww.deborahweinswig.com. Subscribe here to receive Deborah Weinswig’s daily news and analysis on retail, fashion and technology.